The Cavo Tagoo Hotel, winner of the First Prize for Applied Architecture in the Aegean, is superbly situated by the sea, 700 meters from Mykonos Town and 50 meters (150 ft) from the Beach. Offering a high standard of accommodation and service since 1985, this exquisite five-star hotel continues to live up to its reputation as the Top Resort Hotel in its class (awarded in 1999). Nestled against the hillside and protecting its natural surroundings by incorporating rather than devastating, shares a magnificent view of the Aegean Sea, with legendary sunsets. Combining the best of true Mykonian architecture with interiors that reflect the tradition of the island’s heritage, the Cavo Tagoo is indeed "Pour les happy few." Cavo Tagoo allocates 80 units divided into Classic Rooms, Classic Rooms with Swimming Pool, Deluxe Rooms, Deluxe Rooms with Swimming Pool, Family Rooms, Suites and Suites with Private Pool, special Honeymoon Suites with Private Pool, plus Golden Villas with 1 Bedroom and Private Pool, and with 2 Bedrooms and Private Pool. Room amenities are outstanding and include air conditioning; alarm clock and wake-up call; bathrobe and slippers; DVD player, cable movies, movies on demand/pay per view, and sports channels with flat screen TVs; Hi-Fi radio-CD player; direct-dial telephone and voice mail; safe box; mini bar; high speed Wi-Fi Internet access, with fee; hairdryer, full-length mirror and magnifying mirror. From the poolside restaurant you can enjoy spectacular sunsets, and the elegant Tagoo Restaurant, with sushi corner, features distinctly Mediterranean cuisine, including Greek specialties. The view is outstanding! The 38 meter infinity pool and the new Spa are distinct features of this fine hotel. 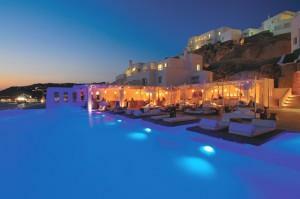 Cavo Tagoo i located in the Tagoo area, only 10 minute's walking distance from Mykonos Town (700m). The minute you enter this room, you feel the soothing effects of a unique sanctuary. Located on the lower levels, the interior offers the ultimate in modern design inspired by Mykonian lines and colours. Luxuriously minimalist, the room breathes purity and sophistication. Featuring four poster queen sized bed or two twins, exquisite marble bathrooms with relaxing Jacuzzi tub, this setting evokes serenity and style. Savour the captivating sea views from the charming balcony. A perfect sybaritic escape. This is a magical retreat dedicated to revitalizing the mind. Located on the lower levels, the enchanting Classic Rooms with plunge pool on the balcony, overlook the marvelous blue of the Aegean Sea. Fusing the Cycladic style with modern aesthetics, the designer deco uniquely blends Mykonian philosophy with ultimate luxury. Whitewashed walls, vivid splashes of colour, plush four poster queen sized bed, revitalizing Jacuzzi tub, all combine to make a cool and calming statement. An idyllic space to soak up the pleasures of Aegean beauty. Located on the upper levels, the spectacular vistas from the terrace overwhelm the senses with the infinite blue beauty of the Aegean. The stylish décor selected with great attention to contemporary Mykonian minimalism, will dazzle you with its whitewashed clean lines, highlighted with bright modern touches. Featuring a luxurious four poster queen sized bed, spacious marble bathroom with elegant Cycladic accents and a relaxing Jacuzzi tub, combine to evoke evenings of romance and intimacy. These are unique rooms in a unique location. This privileged location provides mesmerizing views of deep blue waters and breathtaking sunsets. Perched on top of the cliff, the infinity pool literally blends into the horizon, where you can spend hours daydreaming away in blissful relaxation. Promising to be the epitome of the luxurious refuge, this chic space is designed to offer a unique ambiance with superb facilities and stunning décor where minimalism meets Mykonian architecture. An irresistible trio of decor, pool and view. This living space is designed for guests looking for exclusive and convenient luxury, because the space stands out for its supreme comfort and delightfully modern design. Inspired by the Mykonian landscape, the minimalist deco is punctuated by splashes of vivid color. Bathed in the unique Aegean light, this stylish setting features two bedrooms, one with a plush four poster queen sized bed and a sofa bed, the other with two twin beds, accommodating up to five guests. Both bedrooms share a spacious marble bathroom with two sinks, Jacuzzi tub and separate shower. The ideal choice for an unforgettable family experience. Situated in a privileged location, this masterpiece captivates the essence of the Mykonian spirit. Combining aesthetic pleasures with mesmerizing views of the infinite horizon, this suite is the signature of modern elegance and luxurious comfort. Designed to offer flexibility, the open plan layout includes the possibility of privatizing the bedroom. Offering exclusivity with convenience, this suite can accommodate up to three guests, featuring a stylish four poster king sized bed and a separate ultra-comfortable sofa bed. A true definition of contemporary luxury! Combining Mykonian architecture with a contemporary flourish, this exquisite setting boasts whitewashed walls, sleek lines and imposing designer urns in shades of the Aegean. In this idyllic location, you can savour the magnificent vistas, sipping cocktails by your infinity pool. Experience the most beautiful sunset of the island from your veranda in the company of your partner or friends as this suite can accommodate up to three guests in a flexible layout. Featuring a four poster king-sized bed and a separate sofa bed in the minimalist decorated living room, this irresistible suite embodies the elegance of light and airy Mykonian interiors. Surrender to the luxury and privacy of this magical refuge, situated on the upper levels, offering the ultimate in majestic views. In an ambience of elegant Mykonian minimalism, this exclusive in-hotel Villa features an alluringly chic bedroom and stylish living room. The highlight is the spacious veranda and irresistible secluded private infinity pool with stunning views of the Aegean. You will be enchanted by the breathtaking view of infinite blue and perfect sunsets. This is the ideal choice for consummate luxuriating in sybaritic bliss. The gem of Cavo Tagoo offers exclusivity at its best. Luxuriously decorated with great attention to Mykonian lines, this Golden in-hotel Villa features a spacious, elegant and comfortable living room, two bedrooms with lavish king-sized beds and en-suite bathrooms. Idyllic retreat for family, friends or couples who wish to share memorable experiences in a “villa-like” surrounding. Exclusivity resonates throughout, from the internal Jacuzzi tub to the alluring secluded private infinity pool, creating a setting of ultimate relaxation and tranquility. This is the perfect environment to sit back and be pampered with life’s exquisite pleasures.